Although the students you are recruiting from China may be fluent in your language, pay special attention to ensuring native translations for landing pages. It’s also important to detail the application process as well as any information about your university that you would like to place in front of parents. Anything related to internships, students moving onto careers, or video testimonials from your current Chinese students will help prospective students get buy-in from their parents who may not speak your language. If you have the resources, consider hosting online webinars for students and their parents in their local language, utilizing the language proficiency of your current Chinese students. You may already be working with agents and attending student fairs in second and third-tier cities in China, but have you targeted your PPC Baidu campaign to cities with less competition from international universities? If your university is not at the top of highly-consulted university rankings, spreading awareness for your brand in China will go further in cities which have been less-frequently targeted by international university marketing campaigns. Following up with prospective student inquiries can be arduous, but statistics have shown that Chinese students are more likely to be neglected in this process than other nationalities. Analyze the barriers that may prevent you or your staff from following up with Chinese prospective students and work to improve them to stand out from the competition. The typical approach to digital marketing channels falls flat in China. Make sure to establish and monitor your university’s presence on social media sites like WeChat and Weibo. Don’t forget to search your own website and competitor’s websites in the search engine, Baidu, to ensure you are representing your university with trusted, high-ranking sites. By simply creating a Wikipedia page made especially for your Chinese presence, purchasing banner ads for branding on popular forums like chasedream.com, or listing your university on a translated site like educations.cn, you get your name in front of prospective students before they have to come to you. Approximately 94% of internet users in China connect via a mobile device. Although it’s always important to be mobile-friendly, in the Chinese market, your website performance on mobile will make-or- break your campaigns. Make sure to double-check your translated pages for mobile, and closely monitor your Google Analytics data on China by device for bounce-rate and conversion. The majority of students in China who will study abroad use agencies to simplify the selection, admissions, and visa process. If you have already cultivated a strong relationship with an agency or agency network, ask for their feedback on your website. Placing the right information on your website can help agents better promote your university to Chinese students. Their insider insight can help shape your digital strategy in China. Want more tips to smash your recruitment goals? 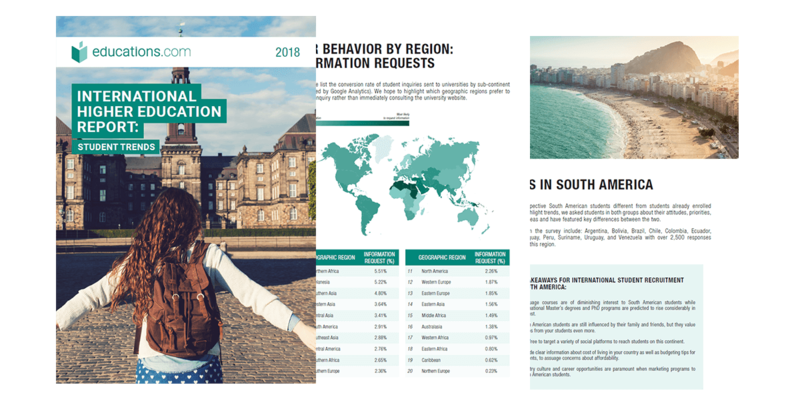 Download our 2017 International Higher Education report, and get up to date information about the latest marketing and recruitment trends.